It’s that time of year again! 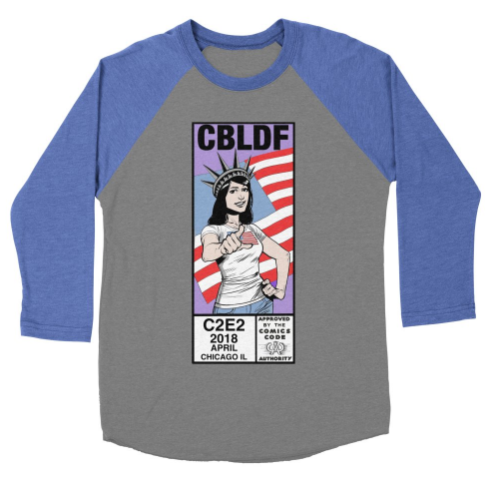 CBLDF is going to be at C2E2 and we are bringing another limited edition CBLDF shirt just for Chicago! Whether you scored one or missed out on last year’s shirt, you already know these will go fast! So make Booth #636 your first stop this year at C2E2! This year’s shirt is designed by Rebekah Isaacs (Buffy Season 10, Gods & Monsters) and features CBLDF’s Lady Liberty and the Comics Code Authority stamp, which you can only get on official CBLDF premiums! The design is available on a raglan shirt or classic tee. Don’t distress if you didn’t realize the convention was this weekend. If you are planning on being in the Chicago area (or just need to crush some airline miles) – tickets are still available! Once you secure your stylish shirt, make sure to check out what other exclusive creator endorsed collectibles are at Booth #636 for your donation! When you are planning your time wisely for the weekend, don’t forget to set aside an hour and join us for our panel on the history of comics activism. It doesn’t matter whether you’re going to be eating deep dish pizza and taking selfies with Batman, or scrolling through all the fun from the comfort of your home – make sure to follow us on Twitter, Instagram, and Facebook to see all the awesome premiums available for CBLDF donors!